Pictured above are some of the hard working volunteers taking a little time off to celebrate!! Cathie Iris Warren, also known as Cathie Iris Odegaard, was booked into Lincoln County jail on Wednesday and faces four felony counts of aggravated animal cruelty, one misdemeanor count of animal cruelty - fist offense, and six felony counts of animal cruelty - second or subsequent offense. The indictment also includes six alternative charges of animal cruelty - second or subsequent offense. According to documents filed with the court, the Lincoln County Health Department has been involved with Warren and her animals since 2013. The situation escalated in April 2016 when Health Department director Kathi Hooper and Lincoln County animal Control Officer, Wendy Anderson, contacted Warren after receiving complaints of dogs barking at a property hear Crossway Avenue in Libby. Hooper and anderson visited Warren's residence on April 21, 2016, and again on June 30, 2016. The two reports detail sub-standard living conditions including overcrowding, lack of food and water, and extreme temperatures. In addition to the dogs, several horses and donkeys were on the property as well as goat, chickens and a large cage of birds. Tobacco Valley Animal Shelter and Libby Friends of the Shelter are currently housing and providing care for the animals involved in the Animal Cruelty seizure in Libby, which occurred earlier this week. TVAS has contracted with Lincoln County to provide sheltering for dogs and cats in the county since 2008. Due to legal circumstances, we are currently unable to discuss the specifics of the case with the public. While we greatly appreciate all of the offers of assistance from the community, the specific areas in which we need the most help are as follows: First and foremost (tax deductible)monetary donations are by far the most helpful, as the burden on shelter resources is tremendous. We have plenty of food for all of the animals due to the generosity of PetSmart Charities organization. Another commodity that we are in need of are towels, of the paper and cloth varieties. Small, soft bedding (please no electric blankets, sleeping bags, comforters, etc.) is another thing that would make the animals stay much more comfortable. As we are doing a great deal of laundry and cleaning, laundry detergent and dish washing soap would also go a long way! Financial donations can be made to Tobacco Valley Animal Shelter at P.O. Box 1815 Eureka, MT 59917 or through our Paypal account at Tobaccovalleyanimalshelter.com .Please call (406)293-5665 if you have any questions. Thank you all SO much for your patience and support during this challenging ordeal. County, Humane Society Rescue Pets Sheriff hand investigation to County Attorney to see whether charges are warranted. "There are no charges yet, but we suspect there will be," said Stephanie Twining, the deputy director of Humane Society of the United States. Kathi Hooper is director of the Lincoln County Health Department. She said she is grateful for the Sheriff's Department participation and that of the Humane Society of the United States. Donations are NOT tax deductible. Montana has no law that provides for the cost of caring for animals after they are seized in a cruelty case, so that cost typically falls on the taxpayers or the goodwill of the community. The Humane Society of the United States provided some financial assistance for the care of the animals and PetSmart Charities also provided food, supplies and financial support. When Cathie Warren was served with a warrant on August 2 last year, she had on her Libby property a veritable menagerie of animals, including 53 dogs, donkeys, horses, birds, goats and cats. After members of the sheriff's department, a veterinarian, a representative of the Humane Society and animal control officers walked through the property and inspected the animals, all of the animals were seized due to concerns about their health and safety in Warren's care. At the close of her trial on April 20 last week, the jury found her guilty of six counts of animal cruelty and two counts of aggravated animal cruelty. Warren was represented by attorney Ryan Peabody, while the state was represented by Jeffrey Zwang, deputycounty attorney. 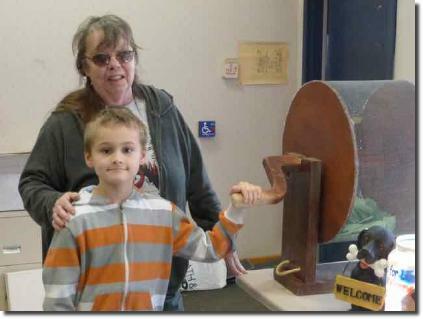 The Kootenai Pets for Life raffle drawing was held Saturday, February 28, at the Spring rummage sale for Kootenai Pets for Life. 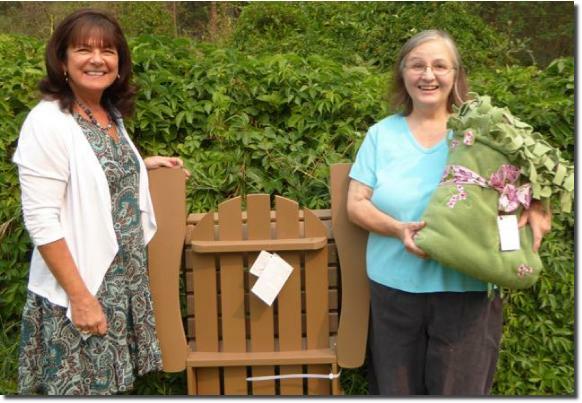 Eileen Carney was the winner of the Doggy Themed Picnic Quilt; Lisa Bargo was the winner of the $100 Gift Card from Rosauers; Jean Buhl was the winner of the Handcrafted Purse and the Beveled Glass Sun Catcher; and Jim Smart was the winner of the Pet Carrier. KPFL was started in 2001 by a group of concerned citizens to provide a humane, no kill Shelter for the stray and abandoned pet population of the Libby/Troy area. KPFL is a non-profit, all volunteer, organization. With much hard work and generous donations KPFL was able to move in to their new structure in Libby in 2009. The Shelter is located at 125 County Shop Road in Libby. The Shelter is open Monday through Wednesday and Friday and Saturday from 9:30 a.m. to noon. It is closed to visitors on Thursdays. Sunday the Shelter is open from 10 a.m. to 2 p.m. Call for an appointment at 293-kpfl if those hours don't work. Volunteers are needed for the hours the Shelter is open. Please call Tami White, Shelter Director, at the Shelter if you can help. There are jobs for everyone from walking dogs and socializing cats, cleaning kennels and play yards, feeding and grooming, to helping out with office work. Volunteering can be a few hours a week to a few hours every day. Every volunteers is appreciated. Volunteers are busy preparing for the 14th Annual Bow Wow Bash to be held October 10. 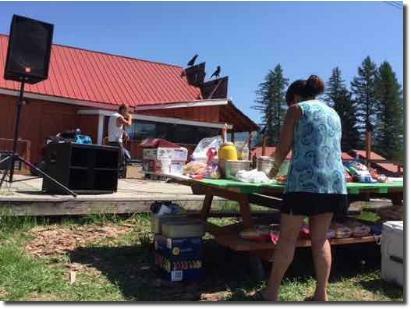 The Bash is the big fund raiser for Kootenai Pets for Life that is held each Fall. This year the Bash will be October 10 at the Libby VFW. Thanks to the generous people of Libby, Troy, and Kalispell, and the donations they have given the evening will be fun for everyone starting with dinner and then followed with live auctions, silent auctions, 50/50 and a door prize. Tickets can be purchased from KPFL volunteers or by calling 293-6801. Please purchase tickets by October 2 so that the caterer can be prepared. KPFL was started in 2001 by a group of concerned citizens to provide a humane, no kill Shelter for the stray and abandoned pet population of the Libby/Troy area. KPFL is a non-profit, all volunteer, organization. The Shelter is located at 125 County Shop Road in Libby. Since KPFL was started almost 3000 pets have been adopted and almost 6500 pets have been spayed or neutered. 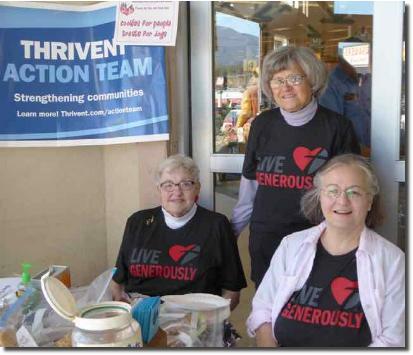 Thrivent Financial and Kootenai Pets for Life joined together to help KPFL better serve its shelter community in south Lincoln County. 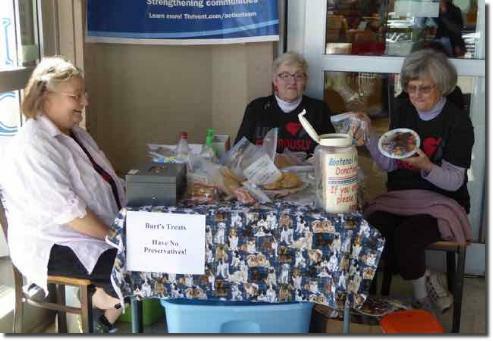 On Friday, April 17, Thrivent member and Kootenai Pets for Life volunteer, Bev Jacobs, hosted a bake sale at Roasters to provide tasty treats for dogs and humans. The goodies were available for any donation. Money raised, along with $250 given by Thrivent, will be used to purchase an air conditioner for the KPFL Spay/Neuter surgery room located at the KPFL Shelter at 125 County Shop Road in Libby. All animals adopted from Kootenai Pets for Life have been spayed or neutered, have their immunization shots and are microchipped. 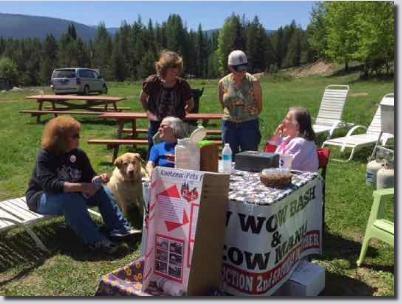 KPFL was started in 2001 by a group of concerned citizens to provide a humane, no kill Shelter for the stray and abandoned pet population of the Libby/Troy area. KPFL is a non-profit, all volunteer, organization. The Shelter is open Monday through Wednesday and Friday and Saturday from 9:30 a.m. to noon. It is closed to visitors on Thursdays. Sunday the Shelter is open from 10 a.m. to 2 p.m. Call for an appointment at 293-kpfl if those hours don't work. Volunteers are needed for the hours the Shelter is open. Please call Tami White, Shelter Director, at the Shelter if you can help. There are jobs for everyone from walking dogs and socializing cats, cleaning kennels and play yards, feeding and grooming, to helping out with office work. Volunteering can be a few hours a week to a few hours every day. Every volunteers is appreciated. Scrooge (aka Keith Meyers) has a change of heart, and donates the proceeds of the Pitiful Players December 19th rendition of "A Christmas Carol" to Kootenai Pets for Life volunteer Judy Hyslop. From the left are Pitiful Players Sheri Brookshire, Ann German, Rick Ball, Keith Meyers and KPFL volunteers Judy Hyslop, Tami White and Connie Holthaus. KPFL was started in 2001 by a group of concerned citizens to provide a humane, no kill Shelter for the stray and abandoned pet population of the Libby/Troy area. KPFL is a non-profit, all volunteer, organization. 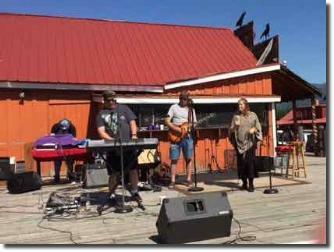 Yaakapalooza - May 6 & 7, 2016 A big thank you to John Runkle and every one at the Dirty Shame Saloon for hosting the Yaakapalooza Benefit for Kootenai Pets for Life. The Friday night Evening with Northwest Writers, The Saturday Full Day of Live Music and the Saturday evening Flashback Prom provided something for everyone. 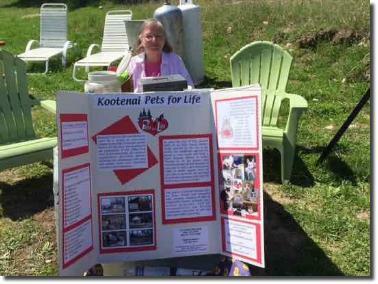 Billy Ritter of Libby and her close friend, Kathryn E. Lee of Myrtle Creek, Oregan are supporting Kootenai Pets for Life in a way that benefits KPFL, the cats and dogs that are adopted and the people who adopt them. 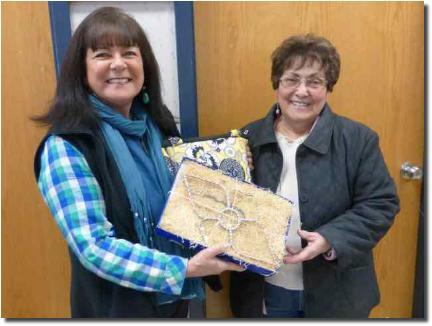 Kathryn is sending, through Billy Ritter, beautiful handmade quilts for the cats and dogs at KPFL. 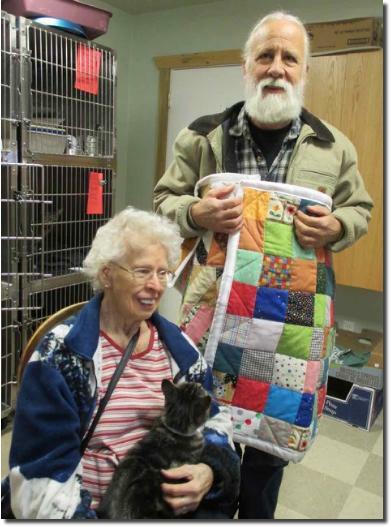 When people like Wayne Rau and Karen Zaso adopt kittens like Griz and Sweetpea they get to pick one of Kathryn’s quilts to take home for each of their adopted pets. There are many more quilts to pick from when you adopt a pet from KPFL, and Kathryn says she is making more to send. Thank you Billy and Kathryn. Rolly is one of many pets available at the Kootenai Pets for Life Shelter at 125 County Shop Road in Libby. Rolly is a happy boy. He is sometimes too exuberant for other dogs and needs to be an only dog but if you sit on his bed with him, he will climb up, roll on his back and put his head in your lap so you can scratch his tummy. He is up to date with vaccinations and he has been neutered. He is black lab mix. 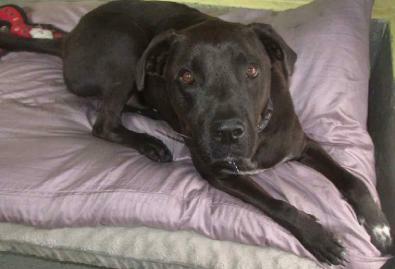 Unfortunately Rolly needs surgery on a torn cruciate ligament in his back leg so he can get ready for a forever home. 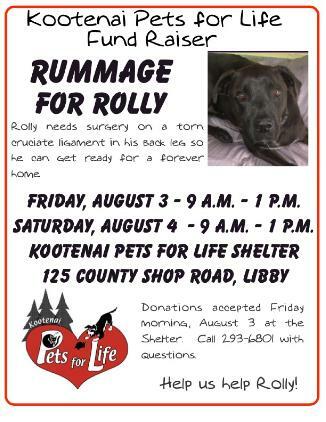 Volunteers at Kootenai Pets for Life are holding a rummage sale for Rolly to raise funds for his surgery. It will be held Friday, August 3 from 9 a.m. to 1 p.m. and Saturday, August 4 from 9 a.m. to 1 p.m. at the Shelter on County Shop Road. Donations will be accepted Friday morning, August 3 at the Shelter. KPFL has adopted out over 3,500 pets and facilitated the spaying or neutering over 8,000 pets. Microchipping was started in 2012 and every pet leaving the shelter is microchipped for easy identification. The spay or neuter of feral cats was started in July 0f 2011 and 745 feral cats have been spayed or neutered.